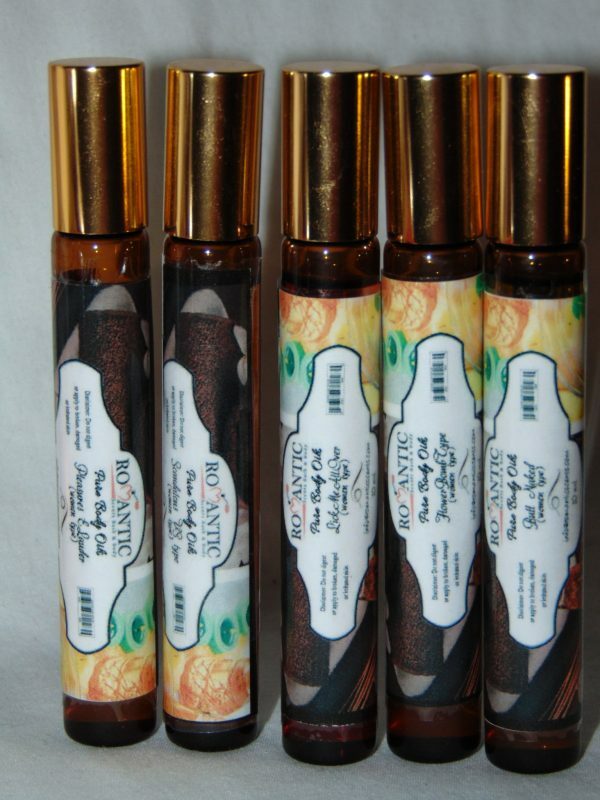 RomanticScents.com Pure Body Oils are among the most favorited type of fragrances to wear. We have body oils for women and body oils for men. Our body oil scents adds a delightful touch to those who are lovers of scented fragrances. We have essential body oils, aromatherapy body oils, designer type body oils, and traditional oils. Our inspired oils are sold as a pure body oil and is uncut and we do not diluted our body oils with alcohol. We Recommend our scented oils for romantic wear. Our scented body oil comes in a one-third ounce roll-on glass bottle. MSRP: $20.00 each. On Sale now for $10.00 each. Experience the sensation of adding to your order the complimentary hand and body lotion, and/or matching bath gel. *Disclaimer* Our Romantic Scented Oils are not made to be consumed or ingested. You can only wear it on your skin, or use it as a body mist or dilute the scented oil with water and make a burning oil. Disclaimer: All Names trademarks and copyrights are properties of their respective manufacturers and/or designers. Romantic Scents LLC Group has no affiliation with the manufacturers/designers. We do not represent our fragrance oils to be original, or exact copies and therefore do not violate any copyright laws. Any references to brand names are made strictly for comparison. This web site has no affiliation to, and is not associated or sponsored by any of fragrance trademark owner. These are perfume body oils not original perfume sprays or cologne sprays.